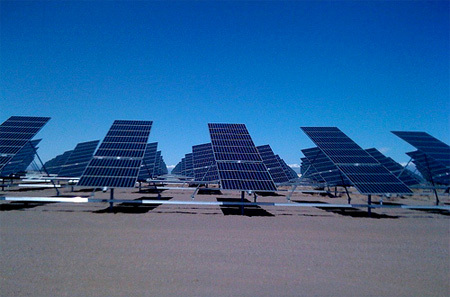 Want your own Solar Power Plant? Have you played Fantasy Football? It’s a game for sports fans, where you play at managing football teams without ever leaving your armchair. If you’re a solar power fan, you can try a new version. Pretend you’re the manager of a chain of solar power plants. How will you invest your budget? Fitting out a big solar plant is different from a domestic installation. You’re in competition with nuclear reactors and coal-fired boilers. The name of the game is very simple: how do you get the absolute maximum power yield for the dollars you invest? Remember to consider solar thermal as well as PV. PV, or photovoltaic, is the mechanism used by the panels on your neighbour’s roof to convert the sun’s rays into electricity. Solar thermal is less common in the ‘burbs. But, if you holiday in a sunny state, you might see an array of low-temperature solar thermal panels at the poolside. Long runs of dark tubing in the panels allow circulating water — the heat transfer fluid — to pick up solar heat and transfer it to the pool. Now, PV is reckoned the better bet for a home installation. But when you’re building a huge plant, solar thermal begins to look attractive. Large-scale PV installations are just thousands and thousands of solar cells hooked up together. They might use different semiconductors from your home panels, but they work the same way. You’ll need a lot of space to build up a facility, and the really big ones get hard to manage. Large-scale solar thermal is nothing like those pool heaters. Some plants circulate water, but others use pressurised steam, synthetic oil or molten salt for the heat transfer fluid. Pressurised steam? Molten salt? Yep, we’re talking really high temperature — when you’re generating power on an industrial scale, it improves efficiency. You can convert all that heat to electricity via a gas or steam turbine, or store it for later use. Now, to get those high temperatures, you’ll need to use Concentrated Solar Power (CSP). There are a lot of exotic CSP options to play with! For instance, you might go for a big array of parabolic reflector troughs, each one focussing the sun’s rays on a run of pipe along its focal line. Relatively low temperatures will make your plant easy to maintain and cheap to run, although the power yields won’t be anything special. 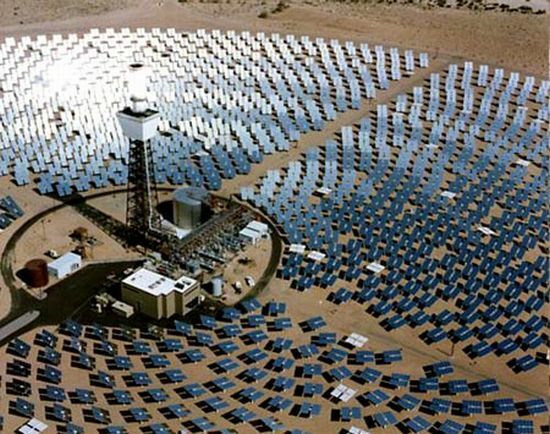 Or you might go to the other extreme with a power tower, using computer-controlled mirrors to concentrate several acres’ worth of sunlight onto a small, superheated target. You’ll get a bunch of high-pressure steam, but pay out a fortune in maintenance. Or maybe you’ll opt for a solar dish, or a Fresnel lens? Whatever you pick, it’s likely that your plant will produce more power for its size than those of your PV-equipped competitors. Figuring exactly how much, and for how long, is where all the fun is. Solar power generation is a new field — and it’s wide open to new thinking. Maybe your fantasy management technique can become reality?